Frequent promos for the Little League World Series on ESPN remind us we’re approaching the one-year anniversary of a story that proved way too good to be true. If you were playing word association, wouldn’t ‘‘awful,’’ ‘‘terrible’’ or ‘‘what the . . . ’’ come to mind more quickly than ‘‘three-time Stanley Cup winner’’ as a match for Patrick Kane? With no say in the matter, Milwaukee taxpayers will help fund a new arena for the billionaire owners of the Bucks, lest they lose their NBA team and a half-share of their town’s big-league identity to another market. A similar scenario has been playing out in Sacramento. It’s extortion, it’s legal and it will continue as long as there are hoops-hungry cities such as Seattle available to abet it. Despite Ray McDonald’s best efforts, domestic violence has become a back-burner story in the NFL — at least for now. Credit (???) goes to Deflate-gate and the idiocy of players such as Aldon Smith, not to any measures the league has undertaken to combat it. Do you still think of soccer as ‘‘the beautiful game’’ as you learn about FIFA, Sepp Blatter and a straight-out-of-Chicago-style business model that makes the Olympic movement seem almost noble? It’s tough to maintain a healthy interest in sports when the values they’re supposed to foster are drowning in greed, corruption and lawlessness. So thank you, LeBron James, for a respite from the mind-numbing drumbeat of bad news. James made an announcement last week that was, if not ignored, totally devoid of the fanfare that accompanied ‘‘The Decision,’’ that misguidedly self-centered spectacle by which he revealed he was forgoing the grit of Cleveland for the glamor of Miami five years ago. He is sponsoring a program that will enable thousands of disadvantaged kids in his native Akron to receive college scholarships. James won two titles in four seasons with the Heat and erased any doubt that he’s the best player on the planet by taking the badly outmanned Cavaliers to the NBA Finals last season. He never has beaten up a wife or girlfriend, never has been arrested, never has been in trouble despite a sadly dysfunctional upbringing that easily could have led him toward bad decisions and dire consequences. Some basketball fans’ unrelenting animus toward James makes no sense. The scholarship program could cost $40 million if enough kids take advantage of it, and there is a tutoring/mentoring component available to prepare them, as well as a community-service requirement. James is as unselfish and outstanding a citizen as he is a basketball player, and some folks hate him for it? I work at Leo High School, a small-but-feisty all-boys school in the Auburn-Gresham community on the South Side. A program such as James’ would be a godsend for our kids, nearly all of whom are college material but are limited in their choices by economic circumstances. One of them, a 2015 graduate named Isaiah, stopped by to say goodbye the other day, off to college in Mississippi. Isaiah transferred in from a nearby charter school three years ago, fearing for his life because he refused to throw in with the gang element that enjoyed the run of the place. The grim reality of her observation haunts me. in the senior class, a dean’s list student, National Honor Society member, co–captain of the baseball and chess teams. He decided to give football a try as a senior and did a terrific job as our punter. ‘‘Leo changed his life,’’ Isaiah’s mother told me. All he needed was an opportunity to thrive in a safe, nurturing, learning environment. James’ scholarship program is Isaiah’s story writ large. James is doing it because he can but also because he cares. And thousands of kids will be better for it. The same day James’ scholarship initiative was announced, Michael Jordan was in a Chicago courtroom, seeking $10 million from a defunct grocery-store chain over unauthorized use of his likeness in a tribute ad. It’s his image and his right to protect it. The jury found for him and awarded him $8.9 million, which MJ said he’ll donate to charity. Jordan is the player with whom James most frequently is compared. This time, it’s MJ following LeBron’s lead. 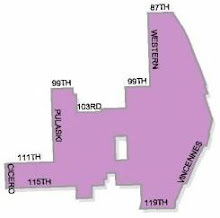 This blog is not going to be about the 19th ward per se. It's going to address and highlight happenings in Chicago and territories beyond, with a sense of humor which honors the traditions of the South Side. Write whatever you want about whatever or whomever you want. Just keep it true and not vulgar. At all times, I am going to comply with Blogspot's community standards. We have seen what happens when there is not such compliance. I am keeping the 19th Ward Chicago name because of the rich blog history going back to 2010 and because I have a ready-made base of similar-thinking readers. For now on, the 19th Ward of Chicago will be mainly a point of reference, an observation deck if you will. A place where allot of good-natured, normal-thinking people still live and can safely view the disfunction overtaking America. I will never publish threats of physical violence or baseless attacks on people or institutions. Out: AOC. In: Little AOC. What do you think? Keep it relevant. States Attorney Anita Alvarez has been caught taking multiple homeowners tax exemptions? HE IS NOT THE KING Thanks to 2nd City Cop and Detective Shaved for this video. October question of the month-Tom Dart. You can't. Forget about it. Copyright 2016. Picture Window theme. Powered by Blogger.